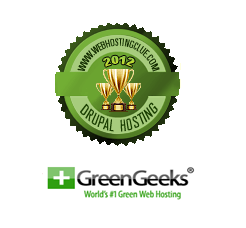 Greengeeks is awarded as 2012 “Best Drupal Hosting” by WebHostingClue.com. This is the 2th consecutive year that GreenGeeks has been named to the top spot in this category. With GreenGeeks, Druapl hosting is easy! WebHostingClue.com, an industry leading web hosting review and rating site, today announces the winners of 2012 Best Drupal Hosting, in which GreenGeeks is named to the top spot in this annual award. As said by WebHostingClue.com's editor team, this award was granted based on the review of the factors like Drupal compatibility, customer support team's skills on Drupal, affordability and customer feedbacks. PHP is run as suPHP to increase Wordpresss security. Host multiple domains in one account, which is great when checking out Drupal multi-site feature. GreenGeeks actively participate in the event initiated by Drupal community. It’s the sponsor of DrupalCon events and chosen as the official hosting for the "Drupal for Dummies" book. Its engineers also show up frequently in Drupal forum to clarify hosting related questions. With a deep level of involvement in Drupal community, GreenGeeks is definitely in a better position to know what are happening about Drupal, and what improvement should be made on its servers to accommodate new Drupal hosting requirement. GreenGeeks engineers have a lot of passion on Drupal, they know almost all Drupal related hosting issues and provide professional answer. Besides this, they have developed a series of guides on how to maintain a Drupal site in their web servers. GreenGeeks integrate Fantastico into their cPanel so that its customers could setup a Drupal site with some simple clicks, this might not be necessary for experienced Drupaler, but will be very help for a Drupal beginner. GreenGeeks is the only web host in the industry who claims for 300% green. It does all the best to reduce energy consumption in business operation, it also purchases wind energy credit to compensate for 3 times the amount of energy used by its servers. People might be able to find a better hosting than GreenGeeks, but it’s would be hard to find a web host who takes Drupal so serious in their business, and what’s more, it’s eco-friendly. Want to know more about this award? Please check out 2012 Best Drupal Hosting from WebHostingClue.com at http://www.webhostingclue.com/best-drupal-web-hosting. WebHostingClue.com is operated by a group of professional web hosting reviewers and editors with a mission to help people find the best web hosting solution for their sites. Their yearly best hosting awards is one of the most authoritative hosting awards in the industry.